SmartShare Systems Tips & Tricks give you good advice and inspiration when you whish to learn more about the StraightShaper products. If you can’t find answers to your questions here, or if there is just something you want to learn more about, don’t hesitate to call our support. Date and time are relevant in many places of your SmartShare, among others for messages in the system-log, various graphs and for the time-managed internet filters. We generally advise to configure SmartShare to be set to local time. When set to local time, the SmartShare automatically switches between summer- and winter time. Do you need long-term statistics? However, if you need to see long-term statistics, you must set your SmartShare to UTC time zone instead of local time zone. In the System Time-box on the Connection page in the GUI, you choose UTC time zone instead of local time zone. If you have never configured you time zone, your SmartShare is as a default already set to UTC time zone, and will not reset statistics. Sometimes it happens that somebody by accident, disconnects a customers SmartShare. Of course this results in unhappy users and that generates unhappy customers. And sometimes – as a retailer, you are not informed that someone has been tampering with the network, only that the network isn’t running properly. With SmartShare StraightShaper VM, every virtual networkport is connected to a virtual switch. In this case the problem can be that the virtual networkport is still connected to the virtual switch, but that the virtual switch no longer is connected to the rest of the network after the tampering. In this case you will not see a warning, and you have to look elsewhere. On the status-page in your SmartShare, take a look at the counts of packages received for each port. If a port does not continuously receive packets, or a port has not received anything for several minutes, you know something is wrong. 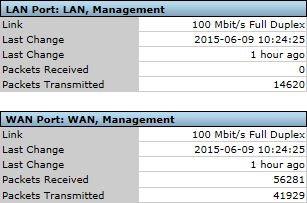 In this example you can see that the LAN-port hasn’t received any packages at all. You can also check your port connections this way if you have a SmartShare StraightShaper hardware-box. Some users wish to have direct access to a page for example, the user-overview page in their SmartShare StraightShaper. You can have direct access to a page in the SmartShare Graphic User Interface by having the page as a favorite in your webbrowser. This makes it fast and easy to get to the information which is important for you. You might have noticed a new Remember me check mark box on the login page in the SmartShare GUI, so you don’t have to type in username and password everytime you log into the GUI. Set your check mark in the box, when you log in, and go to the page you want to have direct access to. Save the page as a favourite i your webbrowser. You will now always have quick and easy access to your preferred pages in your SmartShare, directly from your webbrowser. Date and time are relevant in many places of your SmartShare, among others for messages in the system-log, various graphs and for the time-managed internet filters. When the time-zone is configured to local time it is easier to compare information from, for instance, the system-log with what is going on in the physical world. You can configure the time zone in SmartShare to local time, so you don’t have to convert between UTC and summer- and wintertime when you need to work with hours of the day. In the System Time box on the Connection page in the GUI you just choose the time zone you wish to apply. SmartShare will automatically shift between summer- and wintertime according to the chosen time zone. You can also see our Tips & Tricks a short informative videos here. If you wish to receive our Tips & Tricks directly to your in-box, you can sign up for our newsletter (in danish) here.